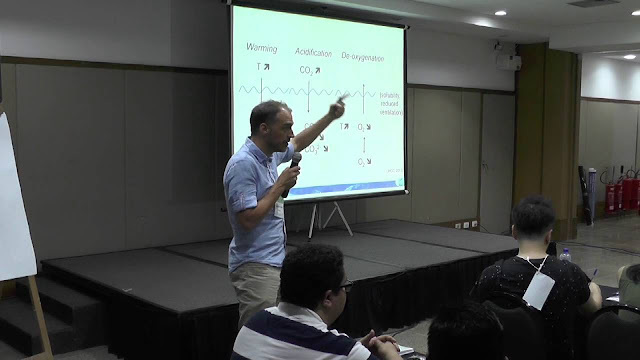 Laurent Bopp is a researcher at the Laboratoire des Sciences du Climat et de l'Environnement (LSCE), Institut Pierre-Simon Laplace (IPSL) in France. His main research interests concern the links between marine biogeochemical cycles, marine ecosystems and climate. He is an expert in marine biogeochemical and ecosystem models (such as the PISCES model), coupled to Earth System Models (such as the IPSL climate model). Laurent Bopp during a lecture in the IMBER summer school 2016. Question: Some researchers say that climate change has a higher impact on women than men. Do you agree? Why? Laurent: It is a good question. I guess it depends a lot on where in the world they are. I mean, society inequalities between men and women are stronger in some places, and surely climate change is believed to increase inequalities. So, that will be the case where such inequalities exist already. Where inequalities are not so pronounced, we hope not to see so many differences in the impacts. Question: Which challenge is the hardest to overcome: adapting to climate change or reaching zero emission? Laurent: I guess we have to do both: go to zero emission and adapt to climate change. And again it will depend where on the planet we are talking about, countries that are very dependent on fossil fuel will have much more difficulties to reduce the emissions, whereas it is believed that countries that have a higher G.D.P will adapt more easily than others. My personal guess is that going to zero emission is difficult, because this is a global goal: if you do it, and your neighbor does not, you simply do not achieve it. Adaptation is much more likely, you can adapt just counting on yourself. So, in a very integrated world, where we share things, maybe we can do both at the same time. In a more fragmented world, adaptation is ok but going to zero emission is impossible. Question: What changes would you like to see in the scientific community in the future? Laurent: I see some nice changes already. But I’d like to see more. So, if I take the examples of the system in France, and I know that in many other places it is the same, it is very hierarchical. We have the professors, then we have the post-docs and the PhD students, and we always see the same ones giving the big presentations, and we should include more flexibility into this. We should have a bit more talking at all levels, not just at the highest ones. But, I’ve seen some changes. So I think it is coming.